So I drove to the sleazy and newly renovated gas station named Speedo. I couldn't wait to get out of the place after I paid for low grade gas that costs more than premium used too. Then I met Kandy. 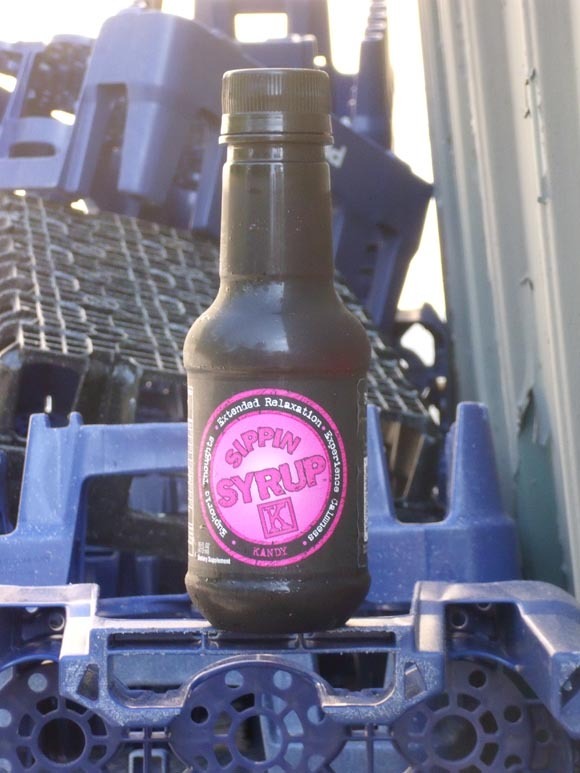 No, Kandy wasn't a stripper, or love distribution specialist, but a flavor of Sippin' Syrup. What is Sippin' Syrup? Well it's a so called "relaxation" beverage. Apparently a "relaxation" beverage is supposed to help me unwind, or so it claims. A quick scan of the label reveals some necessary information. Statements like: "Euphoric Thoughts" and "Experience Calmness," blaze the bright pink and black label. Lame statements like those only serve to erode the already weak credibility of the drink in my opinion. The label also informs me of a website (I won't be going there), and gives me a strong admonishment not to drink this if I'm pregnant or a child. The ingredients list has many things that I can't pronounce, and is written in small letters on an inconspicuous part of the label. Just a coincidence I'm sure. Several forms of sugar are present, as well as strange and unpronounceable things that are presumably added for flavor. This stuff is beginning to look less like Kandy and more like Krap. But the Carbo-Nation deserves a good review and I plan to deliver. So I drop a few more dollars on the beat-up counter and take this already chilled concoction back to the house. At my abode I take a seat, grab the TV remote and open Sippin' Syrup Kandy. Folks, words cannot accurately describe how disgusting this stuff smells. It’s a cross between cheap carnival cotton candy left out in the Texas sun, and something that died last week. The word "yikes" came to mind when this less than stellar scent pounced my unsuspecting nostrils, and I can't help but think the taste will be as bad or worse than the smell. So I take the first sip. Repugnant, disgusting, and rancid are the only ways I can describe this. Clearly whoever produces the Kandy flavor of Sippin' Syrup attempted to make this stuff taste like cotton candy, but they failed worse than a square wheel in a downhill race. So I decided after some hesitation to take another sip, just to give this stuff a fair shake. Yuck! Yuck! Yuck! Two sips are all I need here folks, so I will say to Sippin' Syrup Kandy flavor that I say to a variety of things in life, NO! Final Review: Do not buy! Yeah folks this stuff tastes bad, very bad. Do not buy this ever!